he Villa is integrated in a privileged area of pine forest, ideal place to enjoy nature and for long walks in unspoiled surroundings, all in close proximity to spectacular beaches.The house is facing south which is optimal for light orientation. The garden gives full privacy to the guests as well as space for the children. 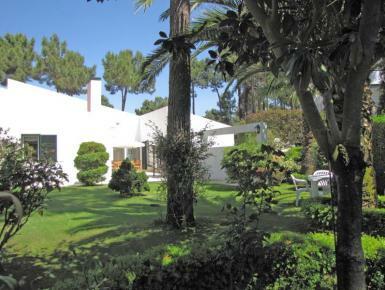 The villa has a garden facing the golf course, with a swimming pool (4m x 4m). Around the pool lies a terrace with outdoor furniture and enough lounger chairs. There is a barbeque and a dining area with a table, that allows pleasant gatherings and fine dinners outside.